DALLAS - The final two playoff spots will be up for grabs when the Dallas Mavericks, Phoenix Suns and Memphis Grizzlies play a serendipitously scheduled round-robin tournament of sorts over the final five days of the regular season. But let's not kid ourselves: There will be only one winner. Playing the mighty San Antonio Spurs in the first round of the playoffs is no prize, as the Mavs were reminded during their ninth consecutive loss to their Interstate 35 rivals, if that term still applies with the recent results between the teams being so lopsided. Not that the Oklahoma City Thunder or Los Angeles Clippers would be a great playoff draw, but a 7-seed would have least have a shooter's chance against those offensive powerhouses. The Spurs have lost three games since the All-Star break. What are the odds of them losing four in a series to a team that had to scrap to claim the West's last bid? Jerome Miron/USA TODAY Sports The Mavs have two goals for the final week of the season: make the playoffs and avoid the Spurs. The outcome Thursday night at the American Airlines Center, a 109-100 win for the Spurs despite All-Star point guard Tony Parker presumably watching from his couch while nursing a minor back injury, actually qualifies as one of the more competitive games during Dallas' drought against San Antonio. The Spurs' average margin of victory during the streak, which started way back when Brooklyn Nets head coach Jason Kidd was still running the point for the Mavs, is 15.5 points. Given San Antonio's dominance of Dallas, how could the Mavs possibly muster up any kind of legitimate confidence if they match up in the playoffs? "I'm not going to answer any questions about the playoffs until we get there," Mavs coach Rick Carlisle said. "We've got work to do. One of our goals is to get there. When we get there, we'll talk about matchups. Right now, we've got to win two games." "But I would say the law of averages is in our favor." Well, that's about the best thing the Grizzlies have going against the Spurs, too. San Antonio has won 10 of its past 12 meetings with Memphis, sweeping the series this season, including a 20-point spanking on Sunday. Those pesky Suns, who nobody expected to be doing anything but praying for pingpong balls to bounce their way this year, have at least defeated the Spurs once this season. The Suns took advantage of a tired San Antonio team missing Parker and playing the finale of a nine-game "Rodeo Trip" on Feb. 21, blowing the Spurs out in Phoenix. The Suns get another shot at the Spurs in San Antonio on Friday night, and only Gregg Popovich knows what kind of lineup Phoenix might face. Pop could certainly opt to give a veteran's day off to proven champions such as Tim Duncan and Manu Ginobili as well as key role players given that the Spurs need only one win or one Thunder loss in the last week of the regular season to wrap up the West's top seed. "We're going to have some of that good barbecue that they have here, enjoy it for half an hour and then we'll think about tomorrow," Popovich said moments after the Spurs shot 16-of-34 from 3-point range to put away the Mavs. Without a trace of sarcasm, Carlisle refers to Popovich as "as great a coach as there's ever been in any sport, in my opinion." The 61-18 Spurs' success this season while managing the workloads of the 37-year-old Duncan, 36-year-old Ginobili and 31-year-old Parker certainly helps that case. Is there a better exhibit of teamwork in sports these days than watching the Spurs? They're the best ball-movement team in basketball, as Mavs forward Shawn Marion said, and arguably even better tied together on the defensive end. Dirk Nowitzki, who lived the long-ago glory days of the Mavs-Spurs rivalry, sees a San Antonio team that could contend with the franchise's four championship squads. 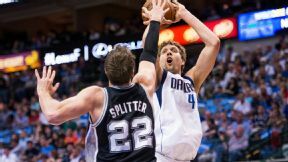 "They're obviously still well coached, play the right way, share the ball," Nowitzki said. "They spread the floor, probably have the most shooters on any team in this league, and they've still got Parker and Ginobili wheeling and dealing and Duncan's still solid. "So, yeah, they're definitely up there. And last year if they hit a free throw and get a rebound, they have the championship won. They're definitely up there." Marion, the only other player remaining on the roster from the Mavs' 2011 title run, isn't sure about that. With all due respect, he's not quite ready to declare these Spurs as championship material, saying that Duncan has "slowed down just a little bit." Marion did mention that he still believes Duncan can put up 20-10 nights easily in the playoffs, a pretty safe prediction given Duncan's 20-15 performance against the Mavs. "They've had troubles with a lot of teams in the Western Conference as well," Marion said, apparently referring to the Houston Rockets and Thunder, who are a combined 7-0 against the Spurs this season. "Not us, but a lot of teams they've had matchup problems with." Not the Grizzlies, either. Maybe the Suns can make that claim, but double dare you to put your mortgage down on this season's surprise team stunning the Spurs in a series. That's why this round-robin tournament is a race for seventh place as much as it is a battle for two playoff bids. The Grizzlies, the odd team out at the moment but only a game behind the Suns and Mavs with a couple of cupcakes coming up on their schedule, go to Phoenix on Monday and will welcome the Mavs to Memphis for Wednesday's regular-season finale (April 16, 8 p.m. ET, ESPN). "It's kind of weird how that worked out," Nowitzki said. "It's almost like the league knew what they were doing. It doesn't get any better than that where the teams that are trying to get in are all playing each other and there's a lot at stake." One loser gets a lottery ticket. The other gets a first-round trip to San Antonio. MVP: There was a point midway through the fourth quarter when Timofey Mozgov stepped into a 3-point shot at the top of the key, and nobody seemed shocked when it went in. Finishing the game with 23 points and 29 rebounds, Mozgov had the game of his life, completely dominating a Warriors frontcourt that wanted to be anywhere but there. X-Factor: With 4.5 seconds left in the game, coming off a potentially devastating floater from Stephen Curry to put Denver down one, the Nuggets went to their anchor. After a couple bruising dribbles, Kenneth Faried lifted up just below the free throw line and hit the right-handed hook to give Denver the win. Defining moment: Midway through the first quarter, Andre Iguodala reaped Quincy Miller's ankles at half court with a crossover that completely laid the young Nugget out. Denver may have gotten the last laugh, but that unfortunate lowlight may follow Miller for the rest of his career. MVP: Kawhi Leonard destroyed the Mavericks, finishing with 16 points, 16 rebounds and five assists. His defense, deflections, offensive rebounding and shot-making helped keep Dallas on its heels all night long. X-Factor: The outside shooting for San Antonio frustrated Dallas early and ended any hope of a comeback late. The Spurs connected on 16 of 34 attempts (47 percent), tying a season high for makes and burying the Mavs in the process. That was... scary: Hall of Famer Tim Duncan went down in the first quarter holding his knee. During a rebound attempt his knee seemed to bend inward at an awkward angle. Duncan eventually got up, walked off the pain and returned to action, finishing with 20 points and 15 rebounds. Timofey Mozgov: The big man best known for ending up on the wrong end of a Blake Griffin poster had the game of his life Thursday, taking advantage of David Lee's absence to torch the Warriors for 23 points and a career-high 29 rebounds. He's the first Nuggets player to post a 20-20 game since Carmelo Anthony in 2010. Quincy Miller, Nuggets: The story the box score tells is bad enough (six points, 2-6 FG, team-worst plus minus of minus-10). But Miller earned his spot here thanks to this Andre Iguodala crossover. "I think there's a certain criteria where you can say pretty much for certain that he's one of the top 12 all-time." Jerome Miron/USA TODAY Sports Both coaches had plenty of praise for Dirk Nowitzki on Thursday, but that didn't stop the Spurs' Kawhi Leonard from posterizing the legend. The San Antontio Spurs have won nine straight games against the Dallas Mavericks. That matches the second-longest winning streak for either team in the history of this rivalry. San Antonio won 16 consecutive games against Dallas from 1991 to 1994 and had two other nine-game streaks (1980 to 1982 and 1996 to 1999). The Mavericks won nine straight games against the Spurs from 1988 to 1989.